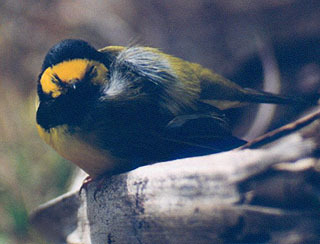 The top 2 photos are of a very tired Hooded Warbler I observed at Ft. Desoto Co. Park with Cheri Pierce and Carol Paine. 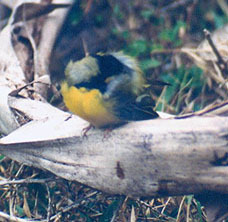 The bird first walked within 4 feet of my feet, only concentrating on feeding. This was around the sidewalk at the mulberry tree. We later found him sleeping on this broken off palm frond at the mulberry tree, just to the left and below the first hummer feeder that you come to from the house. He allowed us to get within ten feet of him while we photographed him. He started out with his head completely buried in his back feathers. He finally put his head up but didn't want to open both eyes. The Peregrine photo was taken at Bradley Junction.